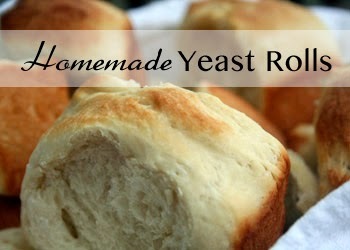 I found this recipe for yeast rolls on one of my favorite source, the Food Network. The five star rating made me stop and think... maybe even a bread newbie like myself could tackle yeast rolls. And sure enough, I did. It does take time for the dough to rise... this is not a throw together for dinner recipe but the hands on time is really pretty minimal... and the results? totally worth it. In a large bowl, add a pinch of sugar to the warm water. Sprinkle yeast over the top and let stand until foamy, about 5 minutes. Stir to dissolve yeast. Beat in the remaining sugar, salt, shortening, cold water and egg until well blended. On low speed, beat in 2 cups of flour and beat for 2 minutes. Beat in enough of the remaining flour, 1/2 cup at a time to make a soft dough. Place the dough in a well-greased bowl and turn to coat the dough. Cover with a towel and let rise about 1.5 hours,until doubled in bulk. Punch the dough down and refrigerated for 2 hours (I usually just pop it in the fridge overnight). The dough will double in bulk. Grease 2 (9-inch) cake pans. Turn the dough out onto a floured surface. Pull off pieces of the dough, about 1/4 C each and shape into 24 rolls. Place 12 rolls, sides touching, in each of the 2 prepared pans. Brush with butter. Let rise in a warm place for one hour, or until doubled. Preheat oven to 425 degrees. Bake the rolls until well browned on top, about 15 minutes. Transfer the pan to wire rack to cool for 5 minutes. *Tip: to help you dough rise, place a heating pad in a large bowl. Then place another bowl (containing the dough) on top of the heating pad. Turn the heating pad to low and it will help your dough to rise.